Tuition is $28/half hour (*except at The Steward School where tuition is $32/half hour). There is a one-time Family Registration Fee of $25 for new students. Private lessons are available in the following areas of study: Piano, Guitar, Ukulele, Mandolin, Banjo, Voice, Violin, Viola, Cello, Bass, Flute, Recorder, Clarinet, Saxophone, Oboe, Bassoon, Trumpet, Horn, Trombone, Euphonium/Baritone, Tuba, and Percussion. 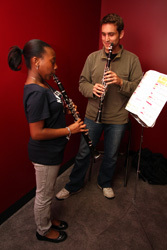 (If you don’t see your instrument, just ask, as we are continuing to grow our faculty).